Our neurologists complete neurological evaluations, conventional/alternative therapy including biofeedback, cognitive behavior therapy, acupuncture/acupressure and hypnosis. Our EEG technicians are also on site and available 5 days a week. 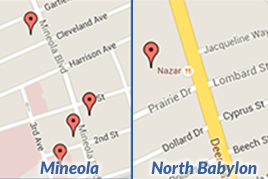 For more information on Winthrop Child Neurology Associates, please call one of our offices listed below.